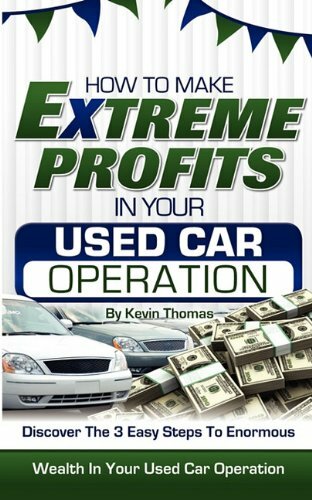 "Kevin Thomas delivers the must read business book of the year for anyone looking to get into the used car business. Kevin combines valuable insight with real how-to techniques that will shorten your learning curve and get you profitable fast. Just executing his Right System concept alone will add thousands to your bottom line." "Kevin has proven time after time his ability to take an auto dealership to the next level and beyond. His understanding of the entire used car operation, from procuring inventory, to reconditioning, sales, and financing is thorough and his business ethics insure him success time after time. I knew Kevin would be successful, and he has surpassed even my ambitious predictions." Are you an auto dealer wondering how to manage stagnant growth and low profits? Are you afraid the current economy will force you to close up shop? Let's face it. Our industry has changed dramatically in recent years. But as a dealer, when I turned to the so called Guru's for answers to my questions, their advice and ideas were stale and out of touch. I decided to take control. While I couldn't influence gas or stock market prices, I could harness my fifteen years of industry experience and focus on controlling "three vital components" of my business: customers, inventory and processes. How to make Extreme Profits in Your Used Car Operation is the most valuable resource on the market today, offering you answers to the questions dealers routinely grapple with. It's a simple plan to help you master the "three vital components," get predictable and consistent results, and ensure your dealership's long-term success. Kevin Thomas knows what it takes to create a successful automotive dealership. The owner and operator of several of Georgia's most successful stores, former President of the Georgia Independent Automobile Dealers Association, and winner of the prestigious Quality Dealer Award; this fifteen year veteran's in depth industry knowledge results from firsthand experience in a wide range of new and used car dealership positions from sales consultant to general manager. A visionary and a trendsetter, and a graduate of the Professional Business Coaching Alliance's School of Coaching, Kevin masterfully combines his hard earned entrepreneurial expertise with his intimate understanding of the automotive world, sharing his knowledge and ideas with companies and industry professionals around the world. On the Board of Directors for the local Chamber of Commerce, and President of the local Rotary Club, Kevin is happily married to his wife and business partner Karyn. They have three children; Ann Marie, Morgan and Kevin Jr.